Eduardo Alberto Cuéllar Navidad is a Judicial Advisor and Assistant Manager responsible of the Electoral Justice Area at the Supreme Electoral Tribunal of El Salvador, where he has held other appointments since 2006. 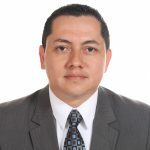 He received his legal degree from University of Central America “José Simeón Cañas” (UCA) in 2005, his lawyer authorization from the Supreme Court of Justice in 2006 and his Master’s degree in Political Science from the same university. He is lecturer of Introduction to Political Science at the Political Science Department of the UCA, a Jesuit university. His work focuses on Electoral Justice, Electoral Law and Constitutional Law.